Suffering from acne, acne scars, fine lines, enlarged pores or are you feeling the drying effects of the cold weather? 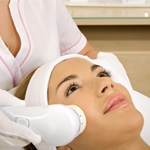 Chemical peels regenerate and resurface the skin by producing a controlled wound to the skin. They remove the top layer of skin to help produce collagen therefore improving sun-damaged skin, wrinkles, scarring and the overall appearance of the skin. There are several types of chemical peels created for different skin problems and types. These peels are divided into superficial, medium and deep. Very superficial peels, remove the top layer of dead skin cells and usually only have a short period of minor cosmetic benefit. Stronger superficial peels performed by our clinician, usually need to be repeated on several occasions for a noticeable improvement in many of the signs of skin ageing. Jessner’s Peel – This peel has been used for over thirty years and is still one of the most popular options for skin rejuvenation. This combination peel brings together alpha and beta hydroxy acids (see below) as well as resorcinol. Jessner’s solution induces superficial peeling of the skin. One of the main ingredients of Jessner’s is salicylic acid that deeply penetrates the skin and removes congested sebum and dead skin cells. These peels are superb for skin that suffers with blackheads, acne, congestion, sun damage and pigmentation. The Jessner’s peel is a mild to moderate form of peeling. Its strength and therefore its peeling effects can be increased, by layering the applications. Retinoic acid peels or Ageless Peel – Retinoic acid is the ingredient found in well known skin products such as Retin-A. Retinoic acid helps to increase the turn-over rate of the skin and make it behave more like a ‘younger skin’. As they can help to reduce damage caused by UV exposure these peels are a good choice for those with pigmentation and sun damage. Alpha-hydroxy acid (AHA) peels – glycolic and lactic acid peel. Glycolic acid is derived from sugar cane, and lactic acid is a naturally occurring acid in the body. These peels may be performed at various concentrations which in turn varies the strength of the peel. Their main function is to remove the top layer of skin which promotes new collagen formation. Beta-hydroxy acid (BHA) peels – Salicylic acid is the main ingredient used in these peels. This peel is perfect for those with oilier or acne prone skins as they are oil soluble and penetrate deeper into the skin. Beta-hydroxy acids are generally larger molecules than alpha-hydroxy acids and therefore may not penetrate as deeply in normal or non oily skin types. The deeper the peel, the more side effects and recovery are needed. Some side effects that can occur are swelling, redness and stinging. Most superficial peels are safe and effective, where medium and deep peels require careful pre-peel preparation and post-peel care. If you have a darker skin tone you may encounter more post peel problems than those with lighter skin tones. Especially pigmentation problems such as post inflammatory hyper pigmentation where the treated skin may become darker than the untreated skin. Therefore, deeper peels in darker skin types must be considered with caution and sometimes it may be better to perform a series of more superficial peels rather than one deep peel. Different skin problems also respond to particular peels. Acne, for example, responds well to our Jessner’ s peel as it is both oil soluble and penetrates deeper into oily and clogged pores, removing dirt and sebum. Wrinkles are best treated with our Ageless Peel which contains anabolic retinoid which corrects and enhances skin function for a long-term restructured and repairing effect. Designed for environmentally stressed skins, severely photo-damaged and pigmented skins. Parts of the body other than the face can also benefit from chemical peels such as the chest and back for acne, or on the neck and décolletage to help reduce sun damage. Our clinicians are always kept well informed and up to date with the latest skin treatments including Chemical Peels and will be able to give you the right advice on the best treatment for you. To find out more call The Australian Laser and Skin Clinic for your complimentary consultation on 1300 786 166.